A tiny Gambier Island cabin on 5 acres caused a stir on the internet in 2010 for its simple, modern, utilitarian design. The building and design process for the cabin was featured in a post entitled Four People (and a Dog) Living in 180 Square Feet on the design blog Apartment Therapy. The post became one of that blog’s most popular posts after it was picked up by a number of other blogs, including BoingBoing, which described it as “a terrific shack”. 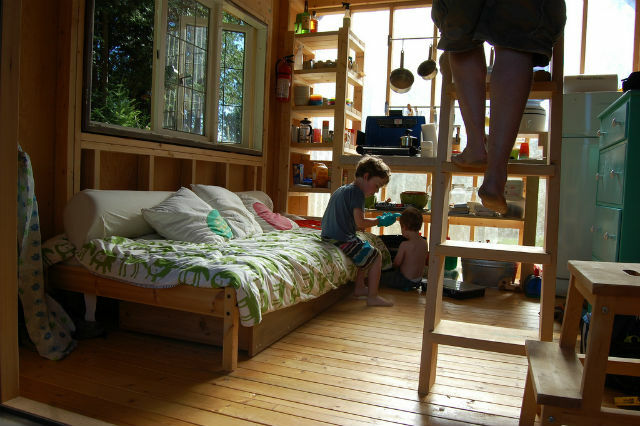 While the tiny size (a grand total of 180 square feet!) may not be for everyone, the cabin’s practical and affordable approach demonstrates beautifully what can be done on a tiny budget.